DxO is an optics an image processing specialist and carries out laboratory tests on almost all new cameras and lenses. The results are fed back into its flagship image-editing tool DxO Optics Pro, which produces extremely high-quality raw conversions and at the same time corrects a whole series of common lens flaws, including distortion, chromatic aberration, vignetting (corner shading) and edge softness. It's closest rival is Adobe Camera Raw, which comes with Adobe Photoshop and is built into Adobe Lightroom. But while this and other programs now offer lens corrections too, DxO's results still set the standard – and it supports the widest range of camera and lens combinations. In version 10.4, DxO has also added a one-click 'Reset' button so that you can quickly return the image to its original state even after you've made a whole series of adjustments. These aren't the only additions. OpticsPro v10.4 also brings support for 466 new camera/lens combinations, including Canon, Nikon, Olympus, Panasonic, Samyang, Sigma, Tamron, Tokina, Voigtlander and Zeiss lenses for Canon, Fuji, Nikon and Olympus cameras. This includes the amazing Canon EF 11-24mm f/4L USM super-wideangle zoom. The Nikon D7200 is Nikon's latest and best 'consumer' DSLR. It has a 24-megapixel APS-C sized sensor with no anti-aliasing filter, so that it delivers the highest possible resolution, even though there is a theoretical risk (though we've heard no reports of this) that you might see moiré effects in some fine textures or patterns. The Olympus OM-D E-M5 II is Olympus's latest enthusiast-orientated compact system camera. It looks like a DSLR but uses a mirrorless design and an electronic viewfinder and has a smaller, lighter body. The E-M5 II has many innovative and exciting features, including a fully-articulating touch-screen display, powerful 5-axis image stabilization and a unique high-res 40MP mode which delivers stunning resolution with static subjects. 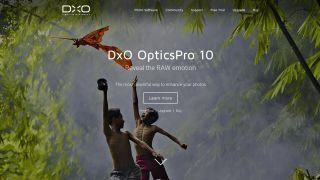 The DxO Optics Pro 10.4 update is free to any existing DxO Optics Pro 10 users, and to any users of DxO Optics Pro 9 who acquired their licence on or after September 1st 2014.